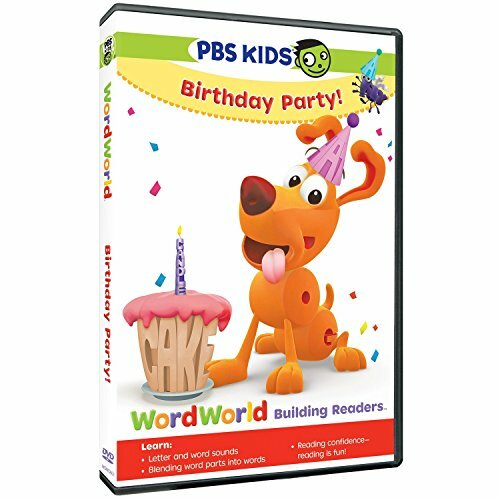 Arlington, Va. � February 19, 2015 � PBS Distribution announced today it is releasing five stories from PBS KIDS' WORDWORLD series on the new DVD Wordworld: Birthday Party! This fun-filled DVD includes five birthday-themed adventures, the first of which, "Happy Birthday, Dog," features a surprise party for WordWorld's friendly canine. Can Frog get the C-A-K-E safely to Dog's party without ruining the surprise? Also included on this DVD is "Bugs to the Rescue!" In this story Ant builds Bear a hot-air balloon for her birthday. When Dog accidentally floats away in the B-A-L-L-O-O-N, Ant gets help from other insect WordFriends to save the day. Join the lovable WordFriends for these and three other educational birthday adventures as they playfully demonstrate the connections between letters, sounds, words, and meaning in order to empower children to advance from learning letters to learning how to read. Wordworld: Birthday Party! will be available on DVD March 17, 2015. The DVD run time is approximately 75 minutes and its SRP is $6.99. "WordWorld," which won the 2009 Daytime Emmy Award for outstanding children's animated program, is designed to introduce, support, and foster literacy skills in children ages three to five. Young children explore the colorful, vibrant world of words with the lovable, legible WordFriends � animals whose bodies are made up of the letters that spell the word they represent. In each story, the WordFriends go on adventures and face challenges that can only be resolved with the right word. That word is built letter by letter, sound by sound. Once the word is built it "morphs" to become the spelled item � C-A-K-E, becomes a cake! Episodes included on the DVD are listed below. It's Dog's birthday and all of his friends are planning a surprise party. There's just one problem � they need a cake! Frog must get to the party safely without Dog finding out. It's Pig's birthday and his nephews, the Three Little Pigs, are making him a secret present. Although Pig promises not to peek, his curiosity about his present gets the better of him�and wreaks havoc all over WordWorld. Will Pig ever learn to be patient? It is Frog's birthday, and Duck wants to make him a big, beautiful birthday cake frosted in the colors of the rainbow. Such a cake requires lots of cans of frosting, and Duck learns he can't just throw cans anywhere � they must be recycled. In WordWorld, recycling means using the letters in a discarded word to make other words, such as can-dle, which is just what Duck needs for Frog's cake! It is Monkey's birthday, and a sick Frog entrusts Duck and Bug to take his present � a banana � to Monkey's birthday party for him. In their enthusiasm to get to the party, Duck and Bug accidentally break the banana into letters�and they don't know how to rebuild it! It's just too big a word. Fortunately Elephant knows a thing or two about big words, and teaches them to build the banana back, bit by bit, based on the three syllables in the word. Ant builds Bear a hot-air balloon for her birthday, but Dog accidentally floats away in it! Ant elicits the help of his insect WordFriends Bug, Bee and Fly to rescue Dog and save the day. "WordWorld" was developed with funding from the U.S. Department of Education as part of the Ready To Learn initiative. Incorporating the latest research into the most effective ways for kids to build reading skills, "WordWorld" produces delightful educational experiences for preschool children, on screen, in print, and online. "WordWorld" is owned by General Word LP. PBS Distribution offers a diverse range of programming to our customers, including Ken Burns's films, documentaries from award-winning series such as NOVA, FRONTLINE, AMERICAN MASTERS, NATURE, and AMERICAN EXPERIENCE, dramas from MASTERPIECE, as well as films from independent producers and popular children's programming. As a multi-channel distributor, PBS Distribution offers consumers high-quality content in multiple formats including DVD, Blu-ray, digital download, and digital streaming. PBS Distribution is also a leading source for factual content for international broadcast, cable and satellite services. PBS KIDS, the number one educational media brand for kids, offers all children the opportunity to explore new ideas and new worlds through television, digital platforms and community-based programs. Kidscreen- and Webby-award winning pbskids.org provides engaging interactive content, including digital games and streaming video. PBS KIDS also offers mobile apps to help support young children's learning. The PBS KIDS Video App is available on a variety of mobile devices and on platforms such as Roku, Apple TV, Amazon Fire TV and Chromecast. For more information on specific PBS KIDS content supporting literacy, science, math and more, visit pbs.org/pressroom, or follow PBS KIDS on Twitter and Facebook.